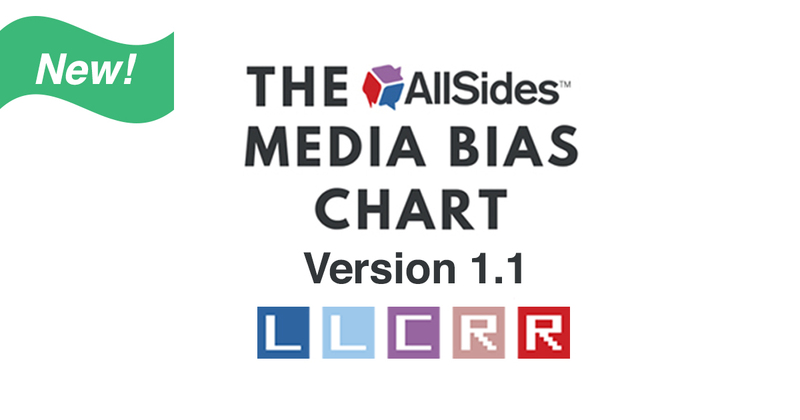 Earlier this month, we released Version 1 of the AllSides Media Bias Chart, which is based on over 600 AllSides media bias ratings. The media bias chart offers an easy way for you to identify political bias in the news, so you can avoid being misled and decide the truth for yourself. We gathered feedback since then, and decided to make a few minor updates to the chart. Check out version 1.1 of the AllSides Media Bias Chart below. We make it clearer that our ratings are for online news content only, not radio or TV coverage. We conducted an editorial review to ensure the NPR Online News media bias rating is up-to-date. We now feature all logos in the center of their columns, making it even easier to see the distribution of bias across our media landscape. We added The Christian Science Monitor, a popular Center media outlet. We removed Investor's Business Daily due to its focus on the stock market, international business, finance and economics rather than general news and politics. We removed Vanity Fair, due to it being more of a lifestyle publication than a political or general news outlet. We removed Daily Kos, which is an advocacy website, not a news outlet. Read our FAQ about the AllSides media bias chart. While we strive to include the most popular news outlets in America, popularity isn’t our only metric — we also include outlets that are good representations of a certain perspective or ideology. For example, Jacobin magazine is included because it represents socialist thought, while Reason magazine is included because it represents libertarian thought. AllSides does not rate outlets based on accuracy or factual claims — this is a bias chart, not a credibility chart. We disagree with the idea that the more extreme an outlet is, the less credible it necessarily is. There’s nothing wrong with having bias or an opinion — there is something wrong with ignoring the other side. It’s also important to note a Center media bias rating doesn’t necessarily mean neutral or unbiased. A Center media bias rating simply means a media outlet does not predictably show opinions favoring either end of the political spectrum. Either they don't show much bias at all, or their bias leans to the left and right equally at different times. It may also mean the outlet does a good job of portraying both sides equally. Sometimes, Center outlets will not give you the full story and will omit certain stories, perspectives or ideas. 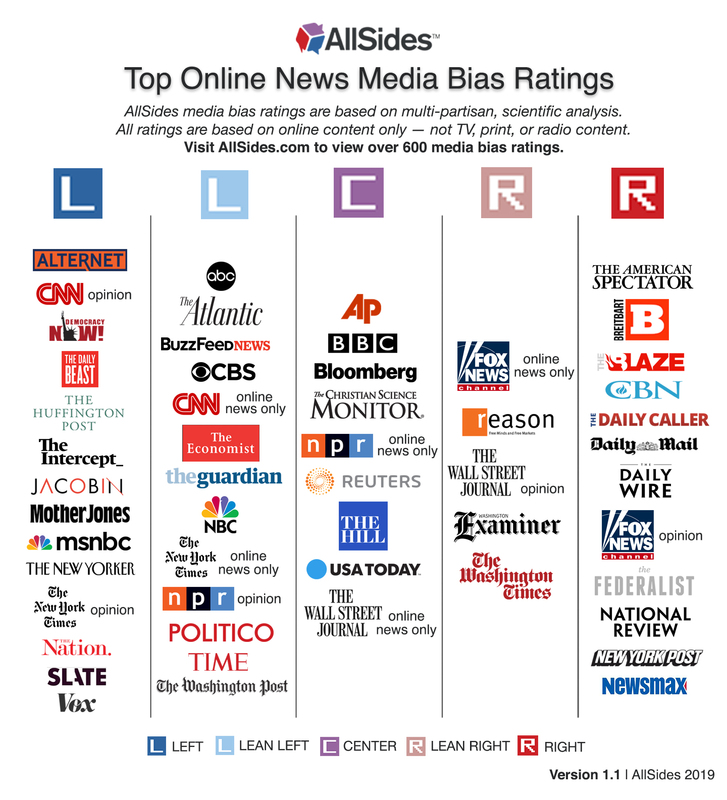 AllSides provides media bias ratings for nearly 600 media outlets, and our methodology is more comprehensive than other media bias charts on the Web. Our ratings are based on multi-partisan, scientific analysis. They are fluid and subject to change over time. Expect more versions of the chart to be released as we gather more data and feedback. Depolarize your newsfeed by sharing the AllSides media bias chart on Facebook.